Amazing tone and power in a highly portable 2x8, all-in-one acoustic combo. One For Strings amps are designed in minimalist style, with custom speakers, cabinets and highly reliable electronic components, all together capable of amplifying harmonics with natural tone. The Acus Sound One For Strings AD is the largest model in the range, in terms of power and sound pressure. The suggested application for this model is for the solo performer or small ensemble as an all-in-one, 5-channel solution. A particular feature of this unity can be found on channel 4, which is equipped with a 3-position switch, that can be used to further enhance the tone of the instrument plugged in. Position 3 – Semi Acoustic/Jazz. Each channel is equipped with a Peak LED, 4 band EQ, Effect volume and Channel volume. Channel 1, 2 and 3 give you the option of Mic/Line input, while Channel 5 is designed for line input only. The system has an aux input, with its own 2 band EQ, 2 outputs (Line/Stereo Out) and its own volume control. Other features include a headphone socket (with a separate volume control), 8 digital effects (adjustable in the master section) and a Resonance Filter, which helps reduce feedback. 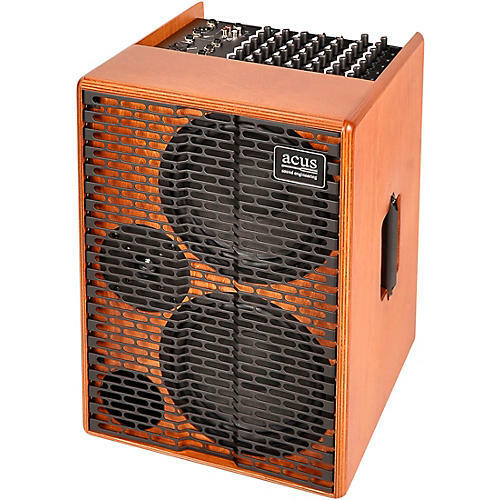 The Acus Sound One For Strings AD delivers 350 watts of power in a 35-lb. package, making it an exceptionally versatile and portable amp. Inputs: three XLR, six 1/4 in. Dimensions: 12.4 x 18.3 x 13.7 in.